This is the collection of Android 7.1 Nougat custom roms and recovery for the Samsung Galaxy S5 G900F and all other Snapdragon Variant. Most of the links here are from Forums and other website. All thanks to the Cyanogen, AICP and ResurrectionRemix developers, we appreciate their hard work. Please appreciate and donate to them if you can. Flashing a custom rom will help give your phone more features and update it to latest android version. do not Install on other Samsung Android Smartphones. The much awaited Android Nougat 7.0 ROM, CM14 for Galaxy S5 CM14/CyanogenMod 14 has now arrived through an UNOFFICIAL build. We also have Nougat 7.0 AICP ROM for Galaxy S5 and OFFICIAL CM14.1 ROM for Galaxy S5. Since Google released Android Nougat Source code, we have update many Android NOUGAT AOSP ROMs and also many CyanogenMod 14/CM14 ROMs updated and many are yet to come. 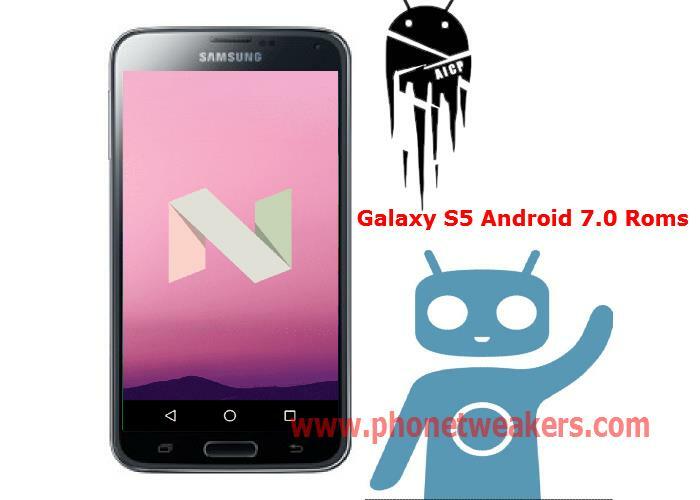 If you are looking CM14 for Verizon model then here is the Verizon Galaxy S5 CM14/CyanogenMod 14 Nougat 7.0 ROM This CyanogenMod 14/CM14 for Galaxy S5 is brought to you by developer Blackjubel. If you like his work and want him to keep up his good work, then you can Donate him via PayPal. There is another CM14 brought to you by haggertk. 1. Download and install TWRP 2.8.7.0 . 2. Completely clean system (Format Data). 4. Install OpenGApps , advise micro and above.